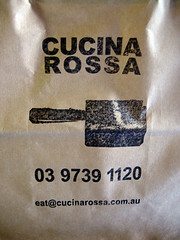 After the fun and games at Punt Road Winery we headed over to Bianchet Winery for a light lunch at their in house restaurant, Cucina Rossa. The food is great and I love their wines but why oh why do they have such a pathetic website ? Do people think it's expensive or just don't understand the potential. I don't want this to be seen as I'm picking on Bianchet but really Australian companies are generally shocking when it comes to web presence. I would have thought that for people in the food industry a good web face would be vital. Anyway, enough of the ranting, let's get back to the food. 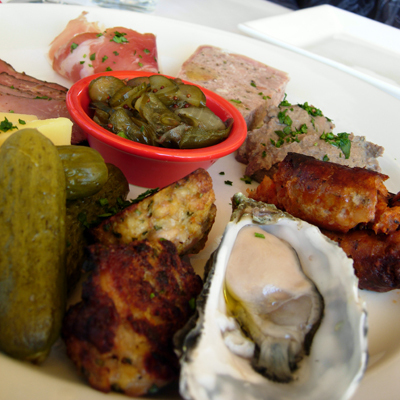 We opted to share the normal and vegetarian antipasto plates - funny considering we skipped the antipasto at Punt Road. 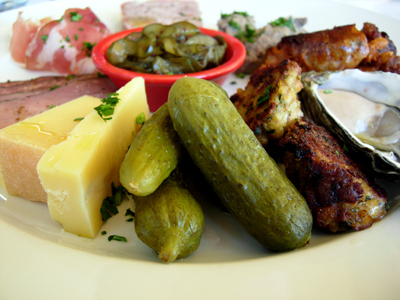 This is the normal version - pickled gherkins, chicken meatballs, oyster, spicy sausage (chorizo), chicken liver pate, terrine, prosciutto, pastrami, cheddar and bread and butter zucchini in the centre. 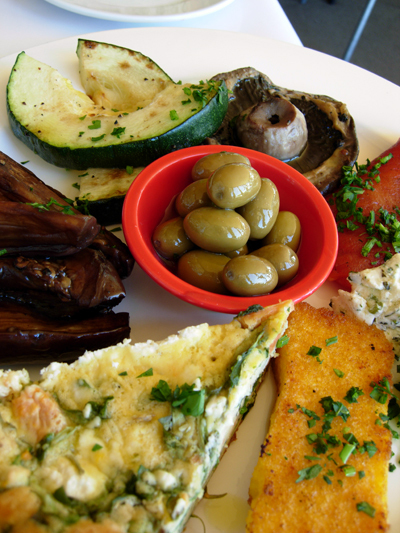 And this is the vegetarian - frittata slice, deep fried polenta, roasted red pepper, grilled mushrooms and zucchini, fried eggplant wedges and green olives. and I opted for one (but they gave me two and after tasting it I was glad they did!) 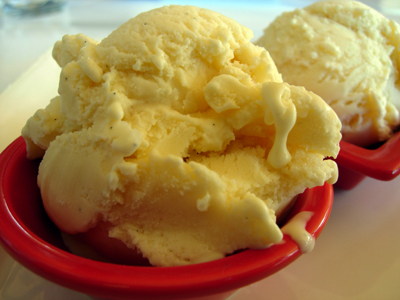 scoops of vanilla and mascarpone ice-cream (also from the Yarra Valley). There's been a change of owners since this post was written so this type and style of food is no longer available. I would strongly recommend looking for a more recent report if you are considering visiting. 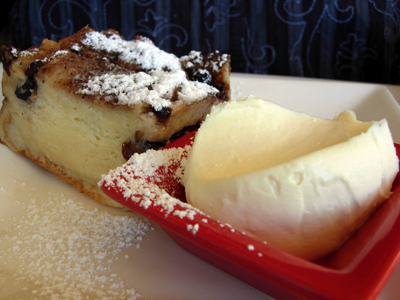 we celebrated a birthday there last year and they do some brilliant winter comfort food. i had the venison in red wine with muscatels on a bed of polenta and it was brilliant! lovely review and great photos as always. must try the desserts next time! 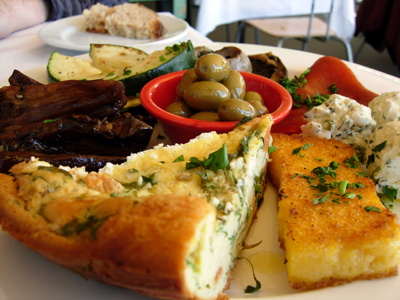 Thanks Truffle - we ate there last winter and totally agree that they have wonderful winter food. I almost skipped dessert but to keep Paalo company I decided to have the ice-cream, I'm so very glad I did. Oh and the clotted cream is utterly sinful.